“Autism is a great cause. We had no problem flying in pieces from Italy to accommodate the event,” said Lisa Cavallini, spokesperson for Emilio Cavallini. with #EXTRAV15, the Celebrity Bowling Party of the Year! Atlanta, GA [July 20, 2015] – Designer Emilio Cavallini will not be showing in New York at Mercedes-Benz Fashion Week. However, fans can catch a few select pieces from the new season of the famous hosiery at Extravaganza 2015 (#Extrav15), a Celebrity Bowling Party benefitting Autism on September 5 at I Luv Bowling in Duluth, GA. An evening of fashion, music, and awareness, Extrav 15 honors the Autism Society of Georgia, Atlanta Autism Consortium, and Gwinnett Autism Spectrum for their commitment to service. College scholarships and small business grants will also be awarded that Saturday night. #Extrav15 is the brainchild of ET Promotions in association with QEB Foundation and the Trufant Family Foundation. A recommendation of Qn. Everlena Brown, president of QEB Foundation, Emilio Cavallini rose to popularity after Madonna featured designs in her half-time show for Superbowl 2012. Kim, Khloe, and Kourtney Kardashian have also done their part in trending the distinct hosiery in recent celebrity sightings. Hosted by Jimmy Papillon and Ferrari Simmons, Emilio Cavallini headlines the four-hour showcase of fashion. This area of the program starts with a designer fashion competition with a $1000 grand prize up for grabs. Contestants submit one of their best designs for $50 and donate $30 per additional design. The program wraps with a presentation of collections by local designers and boutiques. “I’m a radio personality, but have ventured into fashion recently. I can touch the people with fashion in a way I can’t do on the mic…. and vice versa. Being a part of this event allows me to do both to impact the community” said Ferrari Simmons. Tickets are on sale via Extrav15.Eventbrite.com starting at $30, and there are opportunities for sponsors, performers, and co-hosting. #Extrav15 will be the most talked about event this Labor Day Weekend! ET Promotions was created to bridge a husband’s passion for photography with his wife’s passion for all things chic and fashionable. ET Promotions is the company you call on for events, models, stylists, and photography. No matter what you need, ET Promotions is making things happen. QEB Foundation is a 501 (c) (3) non-profit organization to promote literacy in education, finance, and technology. We integrate fundraising and charitable giving into a revenue-generating programs to support the community. We host events and partner with special promos to raise funds. Our ultimate goal is to launch the biggest ENTERTAINMENT EMPLOYMENT EXPO to attract donors to build an online K-12 and credit union. 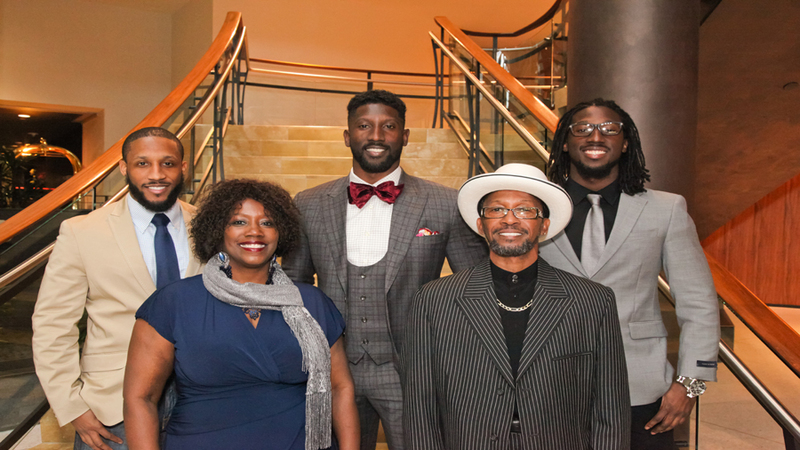 Our purpose for the Trufant Family Foundation is to host programs and fundraising events that provide ways for corporations and individuals to get involved and donate to causes that make a positive impact in the lives of children; thereby, helping them to succeed and making our community a better place to live in.